t*rexes and tiaras: Spread your arms and hold your breath.. I had a day at home this weekend, in between farewell drinks for himself, spinning and kettlebell classes and a movie night with some of my favourite people, I managed to have a day to myself. As I can be something of a chief procrastinator, I made a list, which seems to be the only way to ensure that anything gets done. 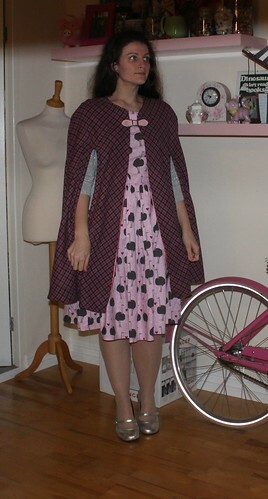 One of the things I wanted to do, after finishing off my hula print dress, was to make this cape. I bought the pattern in a half price sale at the start of the year, I think. It's this one. I picked up the fabric in Barry's in Birmingham last weekend and promptly ordered the leather buckle and the satin lining from eBay. By Thursday all of my cape components had arrived and I was ready to go. The pattern was quite easy to follow. I cut all of the pieces out without issue. In fact, the only tricky part was when it came to the facings for the slashes at the front. I hate cutting things just in case I do it wrong, because it seems like you can't come back from that. Thankfully it was a success. 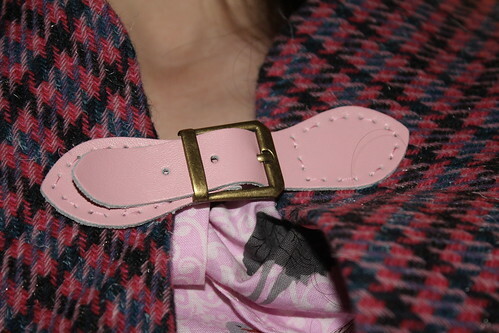 The final touch was to stitch on the leather buckle, which I bought here, and it was done. I'm fairly pleased with it, I like the length and think it will be a good alternative to this Topshop one I'd seen but has sold out. I couldn't wait to wear it so this was yesterday's outfit for Sunday lunch after a morning in the gym. The ostrich dress is fast becoming one of my favourite made-by-me dresses. I took a lot of time over that one, I guess and I like the little touches like the cape collar, which make it that little bit different to ALL of the other 2444s in my wardrobe room. 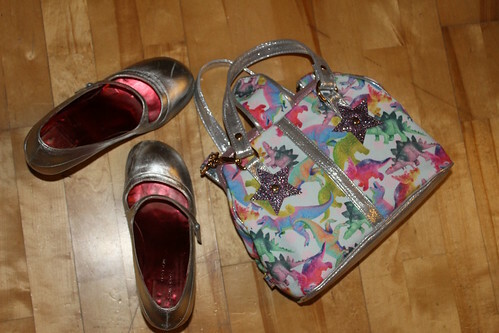 I added some old favourite shoes, and a new favourite bag, both from Irregular Choice. What do you wear for Sunday dinner? And are you a fan of the cape trend? 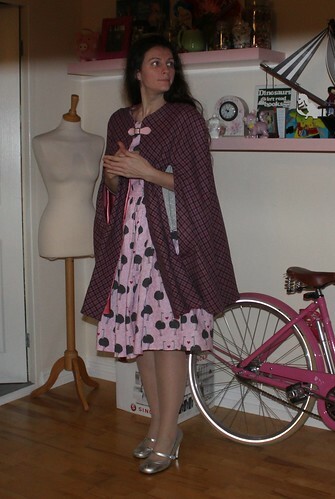 I love capes - it's an adult way of wearing a blanket out of the house whilst still looking chic. The colours in that tweed you've used are beautiful. 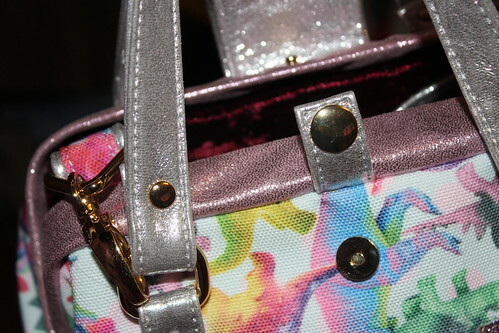 I think your bag is the best thing ever and just perfect for you. Ah this is really nice Char, I love how a cape looks but not sure I could pull it off, I like the peek of pink lining you used. Aw, thanks! I did expect to feel a little odd in it, a bit overdressed maybe but I didn't at all. I'm sure you could definitely pull it off! i can't believe you made that coat yourself, it looks fantastic! wish i was this talented. This looks amazing!! I'd LOVE to make a cape - was it difficult to do? I'm not sure where I'd be able to find some appropriate fabric round here - there are about 3 "good" fabric shops in a 60 mile radius of me, and I've never seen anything like this in any of them :( I'm considering doing a big online order sometime though because I really want some jersey knit fabric too and cannot find that anywhere except online - any recommendations for good online places or do you just shop locally? 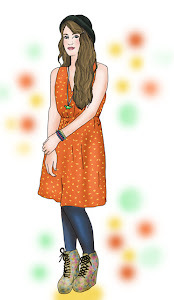 I do a lot of fabric shopping online for dress fabrics, cottons etc. I don't knwo much about jerseys as I've not used them. I'd recommend shopping for things like wool in person as personally I liked to be able to feel how thick it was etc. But there are plenty of good websites, too. I'll have to do a list of them on the blog! :) The cape pattern was pretty easy. Aw thanks! Yeah, it was a productive Saturday at home. Thanks - I still have ideas to do a SATC themed post! I love *everything* about this outfit. Your cloak is gorgeous! Amazeballs! I second the comment from Louise...very SATC in Paris! Aw, I'm so wanting to watch SATC again! Ohh the cape is great! Great job. I'm very much intrigued by capes. I just bought some herringbone coating material from Guthrie & Ghani, ad I think it would be really good for a cape like that, but think I might go for a BHL Victoria Blazer instead. Aww, go for a cape! I haven't tried any of the By Hand patterns yet. It's turned out brilliantly Char, well done! Dress looks lovely too. 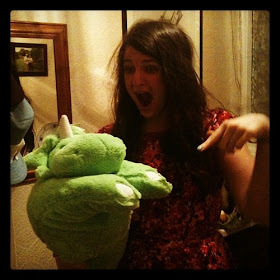 I thought you'd be a fan of the dino printed stuff this season, my little sister loves it. I quite fancy the heeled boots. I love the dino print but I'm sad that there aren't just some regular heels. I was almost tempted by the snow boots but I don't like the unfinished cut of the fabric around the edges.